Everyone expects startups, even successful ones, to undergo a cycle of hype, disappointment and ultimately growth on the way to a sustainable business. But what about new technology markets themselves? Does the growth of a new market follow a similar pattern? Fred Wilson recently wrote about the twists and turns that startups face (expanding on Paul Graham’s astute “Startup Curve”). I’d like to take those ideas further and describe the “Market Curve” — a similar path that new markets take on the path to sustainability. The chart below shows the basic pattern. Markets often experience a “Hype Cycle” of overheated expectations followed by a trough — call it “Facing Reality.” If the market ultimately succeeds, the next phase is “Liftoff.” But troughs don’t end until several ingredients are present. First, there must be broad adoption of core underlying technologies that support the market. Second, there needs to be compelling reference applications to drive mainstream adoption. Finally, there must be a pioneering company, typically with a charismatic leader, that leads the market out of the trough. Obviously not all markets are destined to make it out of their trough. 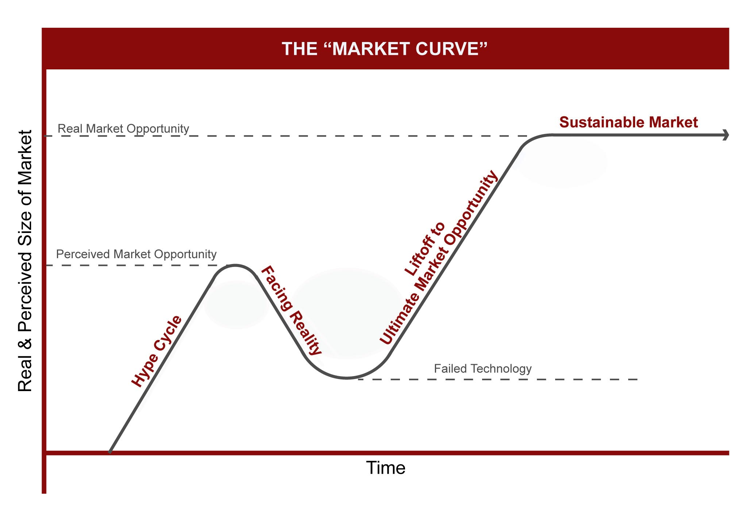 For entrepreneurs and investors the most exciting element of the Market Curve is that, once the trough ends, strong technology markets ultimately prove more valuable than anyone imagined even during the Hype Cycle. 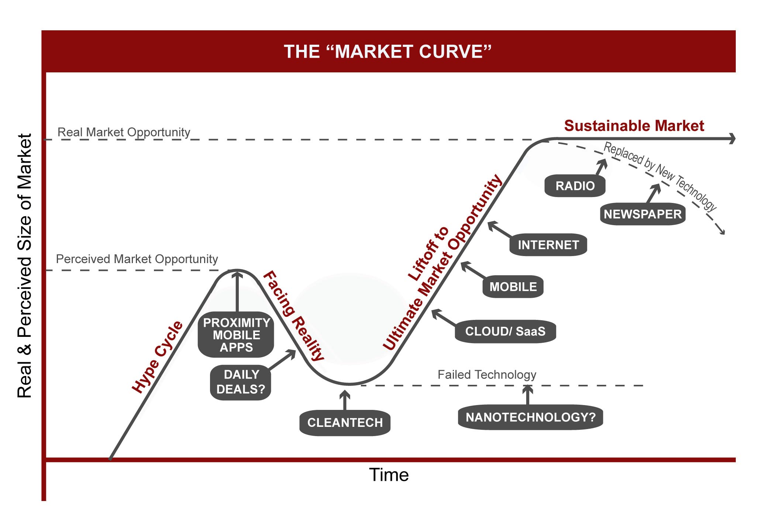 Here are a few examples of how different technology markets fit into this curve. The late ‘90s saw extreme hype surrounding the Internet but the market was simply not yet ready to deliver. With only five million fixed broadband connections in 2000 the underlying technology wasn’t there. Plus there were very few truly compelling applications. The Internet entered its “Facing Reality” trough in the early 2000’s and failed to live up to initial expectations. But, by 2005, there were 43 million U.S. broadband connections and addictive applications like YouTube and eventually Facebook. That year Jeff Bezos launched Amazon Prime and convinced mainstream consumers that they could conveniently and safely shop for anything online. Since then, the Internet has proven to be more transformative to our civilization and more ingrained into mainstream culture than ever imagined. Amazon has surfed the wave of the Internet’s Market Curve almost from the very beginning. Their stock price clearly follows this pattern. Between 2000 and 2005, nearly every VC firm had Mobile as a core investment sector. And, with few exceptions, those investments were unsuccessful. During that time, mobile networks were slow and unreliable (remember the CDPD network? ), devices were clunky and carriers thwarted innovation. Clearly, that all changed when Steve Jobs launched the iPhone in 2007 and replaced the carrier decks with the App Store. And, with more than one billion mobile broadband subscribers globally, the post-PC mobile computing industry is in a “Liftoff” phase that is accelerating beyond wildest expectations. When I first joined my VC firm, InterWest Partners, in September 2000, the Application Service Provider (ASP) concept was all the rage. These ASPs offered off-the-shelf software to enterprises delivered over the Internet. However, between 2001 and 2007, adoption was slow because enterprises were more concerned with security risks than the benefits of hosted software. Over time, Internet security and reliability improved and several pioneering companies, including Marc Benioff’s Salesforce.com and Lars Daalgard’s Successfactors, emerged with proprietary software applications that proved the benefits of SaaS delivery. Today, this market has broadened into a larger paradigm called Cloud Computing with corporations shifting nearly every aspect of their IT infrastructure into the Cloud. This could not have been imagined during the Hype Cycle of this market. Of course, not every market recovers from its trough. For example, while there are certainly specific nano technologies that are fundamental to many products, a broader nanotechnology market hasn’t emerged. It’s not clear that it ever will. And, in my opinion, Cleantech currently sits at the bottom of the trough. Because of extreme capital intensity, long sales cycles and wavering enterprise and consumer interest in “Green,” this market has become challenged. The question is whether Cleantech will ever emerge from the depths of the trough where it sits today and become the powerful market that John Doerr, Vinod Khosla and many others had hoped. In the chart below, I show where a number of current technology Markets sit along the Market Curve. The best investors recognize and take advantage of these troughs and the best entrepreneurs lead Markets out of the trough. When SaaS was in the trough, Marc Benioff built Salesforce.com and Dave Strohm invested in Lars Daalgard at Successfactors. When the Internet was in the trough, Jeff Bezos built Amazon.com and Roelof Botha invested in YouTube. In the case of Steve Jobs, he invented a product and pioneered a business model that altered the Mobile market and led it out of the trough. The key is to have conviction about a Market and, as an investor, look for the technologies, products and leaders that will end the trough. Or, as an entrepreneur, launch market leading products and business models to end it yourself. Marketo is an example of an investment my firm, InterWest, made during a trough. During the late 1990’s, there was a peak of excitement around Marketing Automation with companies like Annuncio, Rubric, Marketfirst and ePiphany. But, the market was not ready. Marketers were not adopting Internet techniques for acquiring customers and they didn’t have sufficient budgets to adopt and implement enterprise software. By 2006 when InterWest invested in Marketo, the company’s founders believed, and my colleague Bruce Cleveland and I agreed, that the market had progressed along the Market Curve. Marketers had begun consistently utilizing search engine marketing, landing pages, email marketing, and online content marketing … all the activities that are harnessed and optimized by Marketing Automation and Lead Nurturing products. And, the SaaS delivery and business model meant that marketers could quickly see ROI without big budgets or IT resources. We had conviction that that the Marketo team would create the compelling products needed to lead the Marketing Automation market out of the trough. Today it seems clear that this market will be larger than expected even during the initial Hype Cycle.